Sebastian Bänfer and Dr Christoph Greb look at embedding media for GSDIM super-resolution localisation microscopy. The super-resolution microscopy technique 'Ground State Depletion followed by Individual Molecule Return' (GSDIM or dSTORM) is based upon a common principle for breaking the diffraction limit: the bigger part of fluorescence signals are switched off during the image acquisition process. Consequently, GSDIM microscopy uses metastable dark states of a fluorophore for spatial separation of single molecules. In order to enhance the probability of entering the dark state, special embedding media play a fundamental role in GSDIM microscopy. The key to overcoming the diffraction limit of ~200nm with GSDIM microscopy is the sequential shutting 'on and off' of fluorophores. In this context, electrons of a fluorophore accumulate in a metastable, non-fluorescent dark state (triplet state and others) by application of a high-power laser beam. From the dark state, molecules return stochastically to the ground state to enter fluorescence cycles that are detected by the microscope - the so called blinking. These events are then captured over time. To get a high-resolution image, the diffraction-limited events are read out by applying a suitable algorithm. Eventually, the ultimate high-resolution image is reconstructed. The most important step in GSDIM microscopy is to get nearly all fluorophores into the long-lived dark state. This process is strongly dependent on the surrounding embedding medium. A number of different agents have proven to keep fluorophores in good localisation microscopy conditions by supporting their non-fluorescing triplet state. Key players in this respect are reducing thiol groups of the respective embedding medium. In consequence oxygen is the counter player in that game and restores the fluorescent state. Up to now the following reagents showed significant usefulness for GSDIM microscopy: Β-Mercaptoethylamine (MEA); Glucose Oxidase-Catalase-Mix; Polyvinyl alcohol (PVA); Mowiol; Vectashield. Depending on their usage there are several advantages and disadvantages for every candidate. One key issue is the functionality of the preferred dye in the corresponding medium - not every fluorescent dye works in every medium. Therefore, when it comes to dual staining, researchers have to carefully match the fluorescent dyes with the adequate embedding medium. 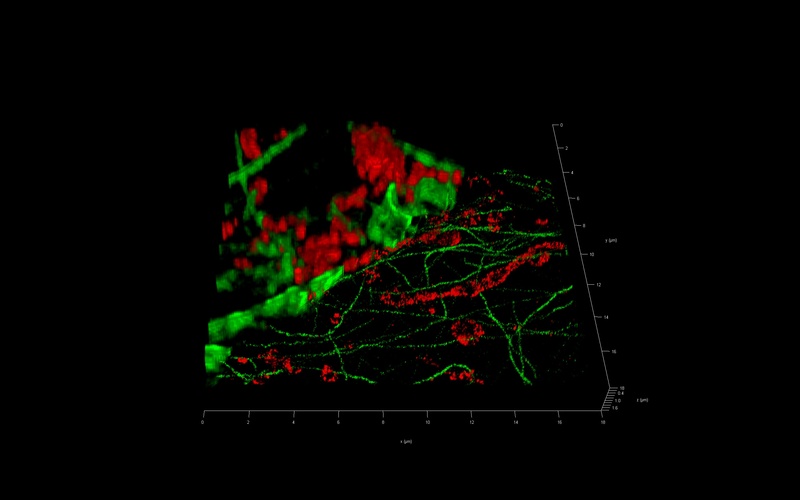 Recently the commercially available Vectashield (Vector Laboratories) proved an excellent embedding medium for GSDIM microscopy. Specimens treated with a Vectashield/Glycerol-TRIS buffer can be stored for months at 4°C without any loss of their excellent blinking properties. Sebastian Bänfer is with the Collaborative Research Center, Philipps University Marburg, Marburg, Germany. Dr Christoph Greb is a Scientific Writer with Leica Microsystems CMS GmbH, Wetzlar, Germany.